Tsirang District court sentenced two men and two teenagers to prison term ranging from three to five years for armed robbery. A valuable elephant tusk measuring 5 feet 7 inches long, along with other valuable ornaments, were stolen from a Lhakhang at Walakha in Guma Gewog under Punakha. The incident happened Friday night. After six years, the maintenance of 87- kilometre Sunkosh-Dagana road has begun. The road is not just narrow but riddled with potholes. So far, 10 kilometres of the road has been blacktopped. His Majesty the King granted audience to people of Thrimshing and Kangpar Gewogs in Thrimshing under Trashigang, yesterday. Monggar Dzongkhag Court sentenced three men to life imprisonment for chorten vandalism. In a verdict passed yesterday, another man was sentenced to 13 years for solicitation and purchase of chortens’ nangten, illegally. The government has decided to give the Foreign Minister, Rinzin Dorje, an “Authorised Absence” in connection with alleged corruptions related to Lhakhang Karpo’s renovation. (Update): Bhutan Council for School Examinations and Assessment (BCSEA) has traced the person responsible for leaking English II question paper for Class XII board examination. The paper was leaked on the eve of the examination. 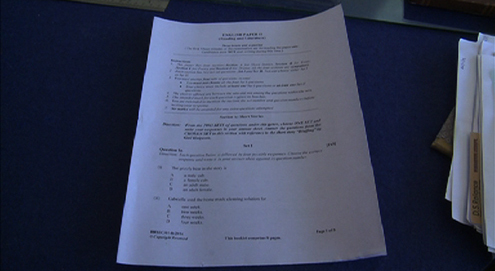 BCSEA had carried out investigation after they received a complaint that the paper was leaked. In an effort to support and educate parents and community members about disabilities, the Ability Bhutan Society, a Civil Society Organisation, recently conducted advocacy and awareness programme in Samtse Dzongkhag. Rural-urban migration has not spared Nabji and Korphu villages in Trongsa. About a dozen houses of the 65 houses are empty in Nabji and 22 out of 81 houses in Korphu are empty. More than 30 journalists, mostly from private print media, have left the profession since 2009, the key factor being financial constraints.